Captain Coram tells the story of sea captain turned philanthropist, Thomas Coram and his vision to improve the life chances of children in the 18th Century and beyond. Nearly 280 years ago, after 17 years of tireless campaigning, Thomas Coram established the Foundling Hospital, London's first home for babies whose mothers were unable to care for them. Thomas Coram continued to campaign throughout his lifetime, championing the welfare and rights of vulnerable children across the UK and changing how the world treated children. His vision foreshadowed the UN Convention on the Rights of the Child, predating it by 250 years. As part of the celebration of the birth of Thomas Coram 350 years ago, Coram Life Education has produced a FREE downloadable school Assembly. The resource includes an assembly plan, interactive whiteboard materials, and activity ideas. The Captain Coram Assembly can be downloaded and delivered as a stand-alone assembly for free. Alongside the Assembly, the Captain Coram teaching resource consists of 6 lessons for KS2, and is available for purchase as a standalone resource. Both the free Assembly and the teaching resource are available as part of the wider SCARF resources that support a whole-school approach to mental health, wellbeing, behaviour and achievement. 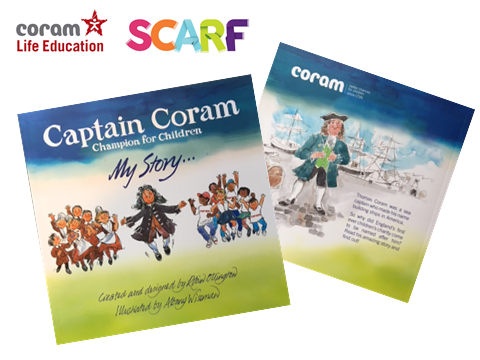 Coram is aiming to raise £46,000 to send a free copy of the book ‘Captain Coram: Champion for Children’ to every school in the UK. To support the campaign and help to tell Captain Coram's incredible story, please visit our JustGiving page.